Come In by Olive Dehn. Illustration by Kathleen Gell. Image courtesy of Shakespeare Head Press & The National Library of Scotland. Children’s books are like time machines. Coming across the same edition of a much-loved book from childhood can instantly transport an individual back to the moment of reading. That visceral reaction, however, is rather different from the time-travel experienced by scholars who are working with children’s books from earlier periods. Sometimes these allow access to actual children and childhoods, as when their owners have written or drawn in them or otherwise affected the contents. More often, however, they take us back to particular moments in culture. Because children’s books are generally designed to tell children about the world and how it works, they can provide a wealth of information about everyday life and attitudes. 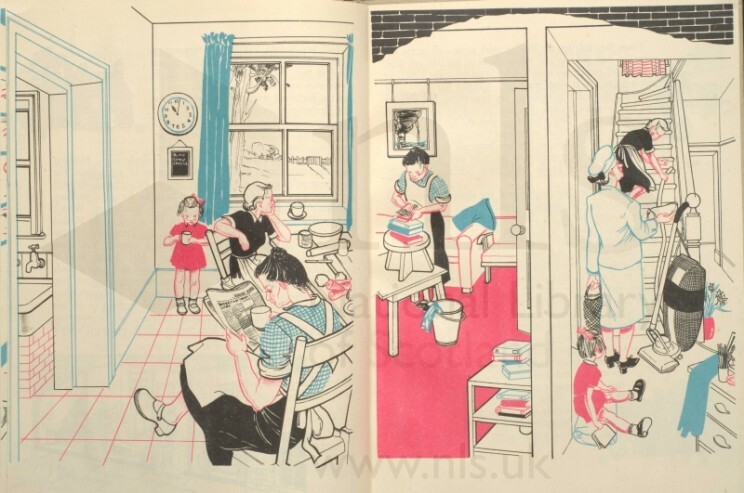 Illustrated books can be particularly helpful in reminding us of what houses, schools, and high streets looked like; who looked after children and how; the rhythm of daily routines and how families and communities interacted. Often it is not the most famous books that are the most interesting in this respect. Olive Dehn’s Come In (1946), for instance, takes us back to a time when children’s books were printed in two colours, when vacuum cleaners and refrigerators were such novelties they had to be introduced and explained to readers, and when mothers followed the advice of Truby King and parked their babies in the pram at the end of the garden all day. In Come In the gardener has to remind the mother to fetch her baby in because it is raining (although clearly not wealthy, this family has both a cleaner and a gardener, though neither live in, another detail of how people lived in 1946). Forgetting the baby is neither a comic nor a dramatic moment in the story, but just part of a day in the life of one family. Come In draws heavily on Olive Dehn’s life, and this is another way in which the book can take us back to an earlier time since the family it features is clearly modelled on her own, making biographical investigation relevant. Unusually in a children’s book of any time the father is an actor. Olive Dehn was married to the actor David Markham who was a Conscientious Objector in World War II. He was imprisoned for a period when Dehn was a very young mother of three, and so it is possible to see this story of domestic routine as a retort to the disruptions and difficulties the pair faced. It is also explicitly feminist in its stance. The book is the work of two women: Dehn as writer with illustrator Kathleen Gell. 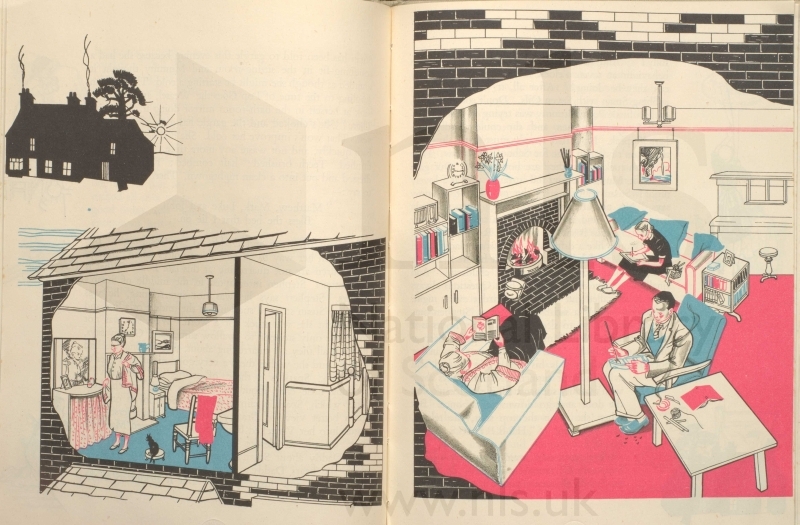 Implicitly the point of view is the illustrator’s who, in a lovely metatextual moment at the end shows herself walking away from the sleeping household with smoke curling up from the cigarette she is smoking! The illustrator has been invited in to observe the family for a day because the mother has complained to the father that nothing interesting happens to her. This is no folktale about being careful for what you wish. The mother’s opinion is vindicated as she works through a round of daily chores while her husband, an actor, is off rehearsing for his latest play and is shown having an interesting and enjoyable time. He may be the bread-winner, but women’s work is demonstrably the more onerous. Come In is a rich text by a woman of great character and conviction — at age seventeen she was escorted out of Germany by the Nazis for writing a highly disrespectful poem about Hitler for Punch. Despite its interest in the position of women, however, it essentially holds up a mirror to its time. Particular children’s writers, illustrators, and publishers more overtly attempted to challenge and change existing ways of thinking, and so give us a sense of how children were being encouraged to understand the world. One example is Eddie and the Gypsy (1935), a translation of Ede and Unko (1931) by ‘Alex Wedding’, the pseudonym of Grete Weiskopf, a children’s writer then based in Berlin. Like Olive Dehn, Weiskopf was not a fan of Hitler. Ede and Unko was among the books burned in 1939, by which time she and her husband had already been forced to flee Germany. Although the story itself would have displeased the Nazi regime since it portrays friendship between a German boy and a gypsy girl, no doubt the illustrations also offended the authorities since they were photographs of real children by John Heartfield (Helmut Merzfeld) who was known for his anti-Fascist montages. Both Come In and Eddie and the Gypsy are so rooted in their time that reading them of itself starts a journey to the past. As this brief discussion has shown, for scholars the interlocking histories of children’s books and their creators can play a valuable role in helping to understand the mindset, the preoccupations and the taken for granted elements of life in the past. Kimberley Reynolds is Professor of Children’s Literature in the School of English Literature, Language and Linguistics at Newcastle University. Her most recent book is Children’s Literature: A Very Short Introduction (OUP, 2011). She currently holds a Major Leverhulme Fellowship to write Modernism, the Left and Progressive Publishing for Children in Britain, 1910 – 1949. The Very Short Introductions (VSI) series combines a small format with authoritative analysis and big ideas for hundreds of topic areas. Written by our expert authors, these books can change the way you think about the things that interest you and are the perfect introduction to subjects you previously knew nothing about. Grow your knowledge with OUPblog and the VSI series! Subscribe to only VSI articles on the OUPblog via email or RSS. My interest is that I was born in 1942, and lived on a council estate in Guildford until 1946, when we moved to Biggleswade (Beds), where I started school, and where I remember borrowing books from the local library soon after I learnt to read. I wonder what proportion of children in 1946 lived in a house with a cleaner or a gardener, let alone both. I am not aware that I knew any other children who lived in houses like this. The houses on our Guildford estate did not generally have running hot water. Our family did not get a vacuum cleaner or refrigerator until the late 1950s. Perhaps “Come on in” represents the sort of house that the author lived in, but it would be a mistake to think that it was usual. I would like to see some demographic data on which was more typical. In response to Trevor Ogden’s message I have to point out that Prof. Reynolds has already stated in her article that ‘Come In’ was based on the author’s own experiences of childhood. Furthermore it says that ‘vacuum cleaners and refrigerators were such novelties that they had to be introduced and explained to readers’. So it seems unlikely that most people in the 1940s enjoyed such commodities. I found this a fascinating article, particularly as it concentrates on two children’s books that I have never heard before. A wonderful source for further research and study. I am looking for a series of books, written, I think, in the forties. The protagonist is a young girl called Jane Turpin. Another key character is the gardener Arnie who enjoyed tripe and onions and liked a ” tipple”. I read these books in the fifties and remember them fondly. Might you be able to help me locate them? Many thanks.